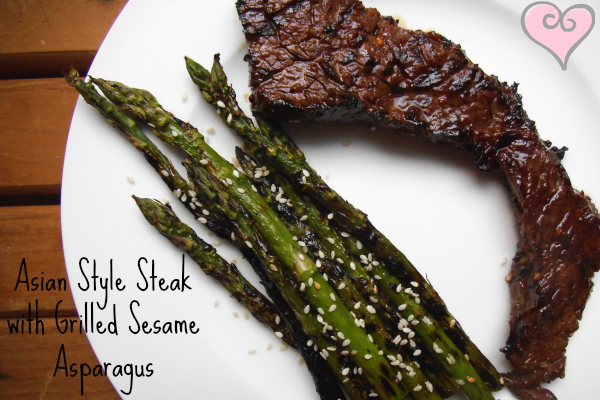 A sweet and spicy marinade for the beef pairs perfectly with grilled sesame asparagus for a complete and healthy meal. With only five ingredients in the marinade, this was an easy way to throw dinner together in a hurry. As most of you have probably figured out, I love my spicy food. Anything less is just too bland! The good news about this marinade however is that yes, if you eat a huge spoonful out of that bowl you'd probably have a burning pain in your mouth for days, but once its on the beef and grilled, it becomes just a slightly spicy yet sweeter than you'd think marinade. Sooooooo yummy! It's a go-to recipe for Ryan and I because it takes almost zero preparation. The asparagus is a beautiful combination of nutty sesame oil with a few sesame seeds sprinkled over. It reminds me of the chinese broccoli you can order through take-out, but with way less yuckiness in the ingredients...and you're body will thank you for it too. There's always some debate over how to grill asparagus. Ryan and I both love it charred like that - where it's still slightly crisp yet tender on the inside. Others hate that char and if that's you, just place a piece of tin foil down on the grill and lay the asparagus over that instead so it still cooks through but without the charred look. 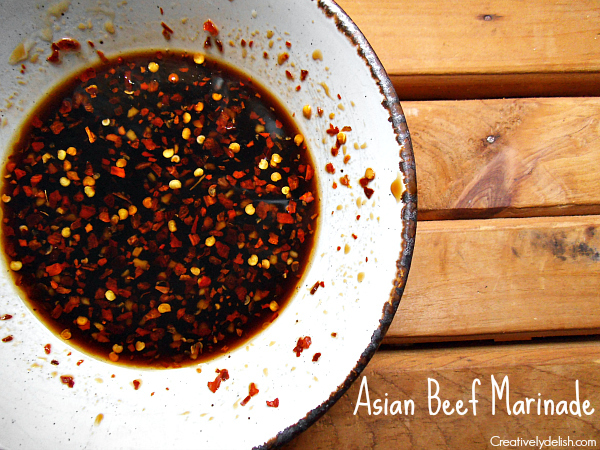 In a bowl, combine tamari or soy sauce, honey, 1 tsp sesame oil, red pepper flakes and minced garlic. Pour the mixture over the steak and let it marinate in the fridge for 20 minutes, then let it rest on the counter for 10. To prepare the asparagus, drizzle them with the sesame oil and ½ TBS of sesame seeds. Mix with hands to combine. 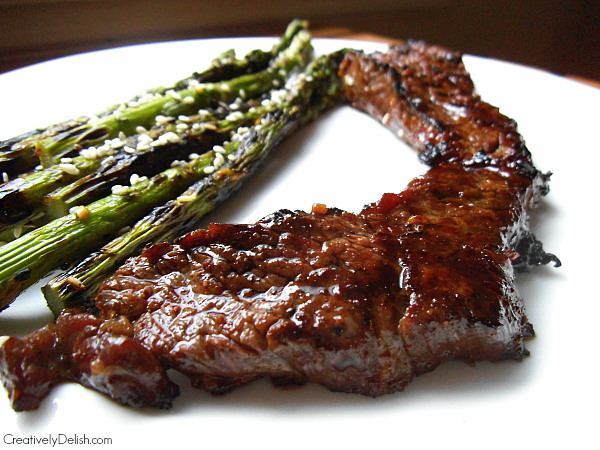 Place beef and asparagus on the grill and cook until all sides are slightly charred, or cooked to your liking. Transfer the beef to a cutting board and let it res for 5 minutes before cutting - this will lock in the juices! 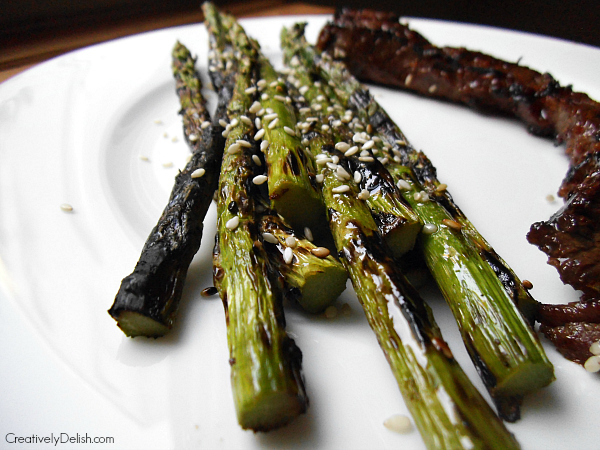 Sprinkle remaining ½ TBS sesame seeds over asparagus and enjoy!